Luke 18:10-14 -- Two men went up into the temple to pray; the one a Pharisee, and the other a publican. The Pharisee stood and prayed thus within himself, "God, I thank Thee, that I am not as other men are, extortioners, unjust, adulterers, or even as this publican. I fast twice in the week, I give tithes of all that I possess." And the publican, standing afar off, would not lift up so much as his eyes unto heaven, but smote upon his breast, saying, "God be merciful to me a sinner." I tell you, this man went down to his house counted righteous rather than the other: for every one that exalteth himself shall be humbled; and he that humbleth himself shall be exalted. The Lord ceaselessly purges the passion of pride in many ways. This passion, more than any other, disturbs our thoughts, and for this reason the Lord always and everywhere teaches on this subject. Here He is purging the worst form of pride. For there are many offshoots of self-love. Presumption, arrogance, and vainglory all stem from this root. But the most destructive of all these kinds of self-love is pride, for pride is contempt of God. When a man ascribes his accomplishments to himself, and not to God, this is nothing less than denial of God and opposition to Him. Therefore, like enemy to enemy, the Lord opposes this passion which is opposed to Him, and through this parable He promises to heal it. He directs this parable towards those who trust in themselves and who do not attribute everything to God, and who, as a result, despise others. He shows that when righteousness—which is marvelous in every other respect and sets a man close to God—takes pride as its companion, it casts that man into the lowest depths and makes demonic what was God-like just a short time before. The words of the Pharisee at first resemble the words of a grateful man. For he says, "God, I thank Thee". But the words that follow are full of foolishness. He does not say, “that Thou hast made me to depart from extortion and iniquities,” but Instead, “I thank Thee that I am not an extortioner or worker of iniquity.” He attributes this accomplishment to himself, as something done by his own strength. How can a man who knows that what he has, he has received from God, compare other men to himself unfavorably and judge them? Certainly, if a man believed that he had received as a gift good things that in truth belong to God, he would not despise other men. He would instead consider himself just as naked as his fellow men in regards to virtue, except that by the mercy of God his nakedness has been covered with a donated garment. The Pharisee is proud, ascribing his deeds to his own strength, and that is why he proceeds to condemn others. 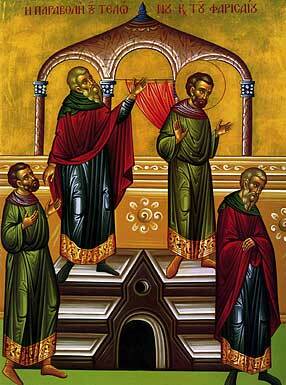 By saying that the Pharisee stood, the Lord indicates his haughtiness and lack of humility. In the same way that a humble-minded man is likewise humble in his demeanor, this Pharisee by his bearing displays his pride. Although it is also said of the publican that he stood, note what follows: "he would not lift up so much as his eyes unto heaven," so that he was stooped in posture. But the eyes of the Pharisee, together with his heart, were lifted up to heaven in boastful exaltation. Nevertheless, the manner in which the Pharisee arranged the words of his prayer can still instruct us. First he says what he is not, and then he declares what he is. After stating, "God, I thank Thee, that I am not as other men are," pointing to the failings of others, then he declares his good deeds, that he fasts twice a week and gives tithes of all that he possesses. The order of his prayer shows us that we must first refrain from wickedness, and then set our hand to virtue. One must not only turn away from evil, but also do good (Ps. 33:14). It is the same for a man who wants to draw pure water from a muddy spring: only after he has cleaned out the mud can he draw pure water. Consider this as well: the Pharisee did not say, “I thank Thee that I am not an extortioner or an adulterer, as other men are.” He could not endure even the association of his name with such vile terms, and so he uses them in the plural, casting these terms at other men, and avoiding the singular, which might associate him with sin. Having said, "I thank Thee, that I am not as other men are," by contrast he points to himself, saying, "I fast twice in the Sabbath," meaning, twice in the week, for the week was called “the Sabbath,” deriving its name from the last day of the week, the day of rest. The day of rest was called Sabbat, and the week was called Sabbata, being the plural form of Sabbat. Whence it is that mian Sabatton is the first day of the week, which we call “the Lord’s Day” (Sunday). Among the Hebrews mian means the same thing as first. So much for the Pharisee. Now we turn to the publican and observe that he is the Pharisee’s exact opposite. He stood afar off, and kept himself at a great distance, not only in physical location, but in his demeanor, in his words, and by his compunction of heart. He was ashamed to lift up his eyes to heaven, for he considered his eyes unworthy of heavenly vision because they had desired to see and enjoy the good things of earth. And he smote upon his breast, striking his heart, as it were, because of its evil designs, and awakening it because it had been sleeping. The publican said no other words than, "God be merciful to me a sinner". By doing this he went down to his house counted righteous, rather than the other. For every proud heart is unclean in the Lord’s eyes, and "the Lord resisteth the proud but He giveth grace to the humble" (Prov. 3:34, I Pet. 5:5).